Finance packages are available from Nova Medical Finance. Nova provides finance for a wide range of cosmetic and plastic surgery procedures, and is run by doctors and other medical professionals. Nova works with some of New Zealand’s top specialists, offering some of the lowest personal loan rates available, to help ensure the best possible outcome for our cosmetic and plastic surgery patients. Applying for medical finance can be done easily through Nova's online application form. 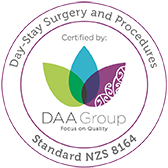 Plastic Surgery Auckland is an Affiliated Provider to Southern Cross Health Society for carpal tunnel treatment, skin cancer diagnosis and skin cancer treatment.